Organizationally we have always worked to find pathways that open doors for our creators, and opportunities to pursue career driven goals. That is why we actively work to create partnerships and work on projects with likeminded arts organizations. These partnerships can take a variety of formats and develop in hybrid ways for us to be interested. Our core metrics for choosing projects and partnering with organizations include; alignment with our mission to create opportunities for autistic creators; and consistency with our values around promoting inclusive practices generally for those that experience barrier to practicing their chosen art form. We are interested in promoting our talent pool of creators, into professional opportunities when they have reached that level of skill, and defined that direction as an interest in their career pathway. However, we also recognize that exploration of ideas and exposure to artistic practices to develop ones’ direction is also important. This is also a core way to build community and build relationship with collaborators, or learn about new ideas and see current work in the arts. Wherever possible, we aim to forge partnerships that reach this goal and build opportunities for integration, representation and recognition of talent in this sector generally. 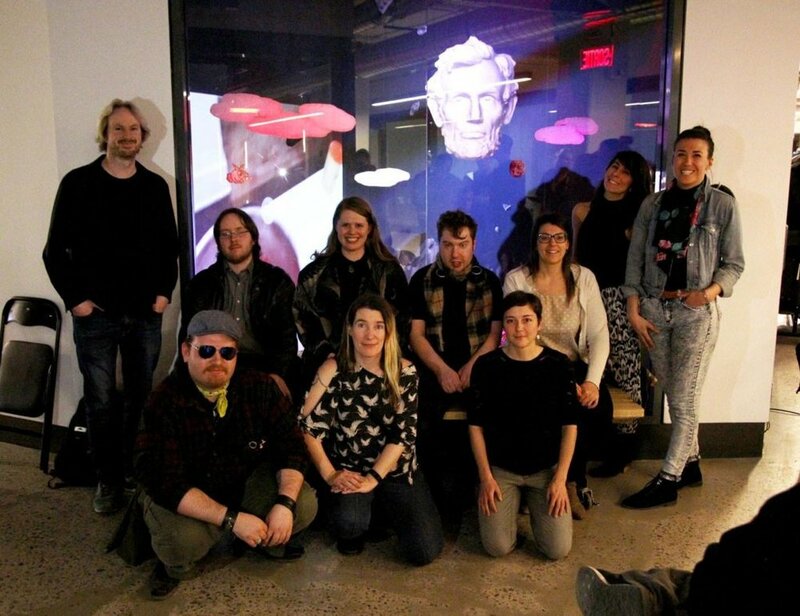 Please have a look at our partnerships to date below, and read about our strategies to prepare our creators for this pathway in our Creative Media Lab program here. In the Showcase, heterogeneous objects are in suspension. 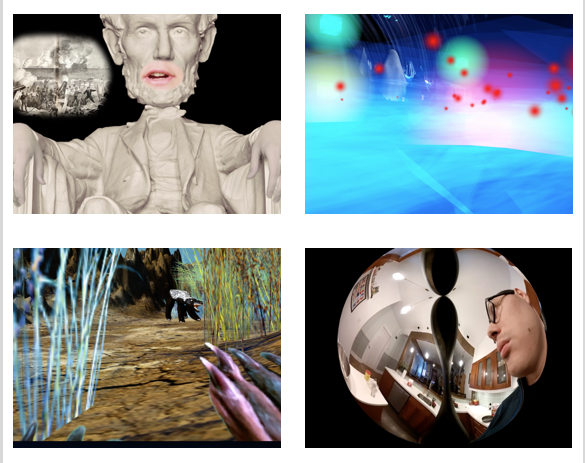 Clouds, sculpted head of Abraham Lincoln and strange animals form a universe where converge the four projects of virtual reality created for In the head - an immersive experience. Extracts of these are projected on one of the walls of the Vitrine. In the light of the "Making of" broadcast on an iPad placed inside the glass, we understand the importance of the creative process at the origin of the projects. Produced by TOPO and initiated with directors Martine Asselin and Annick Daigneault, the projects took shape during a series of workshops bringing together neurodiverse and neurotypical people. If we juxtapose the two types, the first of which corresponds to the many facets of autism, it is that In the head - an immersive experience falls within the paradigm of neurodiversity, which recognizes the richness of the differences in learning and of perception [i]. Rather than perceiving autism as a functional constraint, we see it "as providing new capabilities [...] [ii]". Thus, the project brings together singular voices in order to open artistic practice to new possibilities. During the workshops, the discussions allowed everyone to express their interests, their ideas to explore. Whether by words, drawings, sculptures, sound work and moving images or by creating 3D animations in the Unity software, everyone has contributed to virtual universes. Programmers joined the group during the process, during programming sessions, following the game jam model, under the direction of Peter Wilkinson and the Osmos Academy project incubator, to integrate the content created in the workshop and finalize the results. projects. Four main themes were selected during the workshops. They inspire the projects that are explored using the virtual reality headset (during the opening in the Showcase, and later, in the production area of TOPO at 608). Abstract world takes us to the heart of fantasy: an exploration of shapes, colors, strange objects and vertigo effects. Sweets with Pete offers an immersive version of the animator's cooking show to make a video "of which you are the hero": by putting on the headphones, the viewer is in the cook's position, as if the hands were an extension of his body. Terry's adventures take place in the heart of the forest. The spectator is in the skin of a ratel, a carnivorous animal that, during the hunt, sees improbable animals. A meeting with Lincoln presents the president's memoirs, told through his effigy: a sculpture whose face is animated. If the result is both fun and fascinating, In the head - an immersive experience is above all a group exploration whose crystallization evokes the possibility of a fruitful encounter between different relationships to the world.